QTY 1234567891011121314151617181920212223242526272829303132333435 Please select a quantity. The stone of passion and balance, garnet has a history of 5000 years. It brings the energy of Sekhmet (Egyptian God of War) and Sun to ground you from harm. 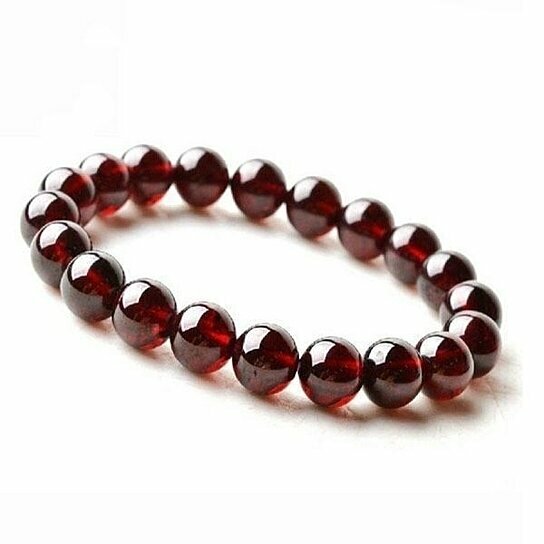 Whenever you feel uneasy and out of wits, this natural and precious garnet bracelet can root you. That’s because it awakens the root chakra vibrations to connect you with Mother Gaia as well as your kundalini energy located in your sacral chakra. Garnet is a stone used for physical disorders because it can raise your immunity and lifespan by uprooting underlying disorders. It is a stone of commitment that helps you stay determined and dedicated to your goals. You will feel newfound energy of enthusiasm and your fatigue or lethargy will be gone forever. Garnet can clear emotional hurdles and make you a happy and satisfied person. How to Clean Your Garnet Bracelet? As garnet contains aluminum, it is unsafe to clean with water. All you need to do is take a cotton rub and swipe your garnet well to physically clean it. For metaphysical cleansing of your garnet, place clear quartz or selenite on it. You can recharge the bracelet by placing it on your root chakra and meditating for five minutes before wearing it.